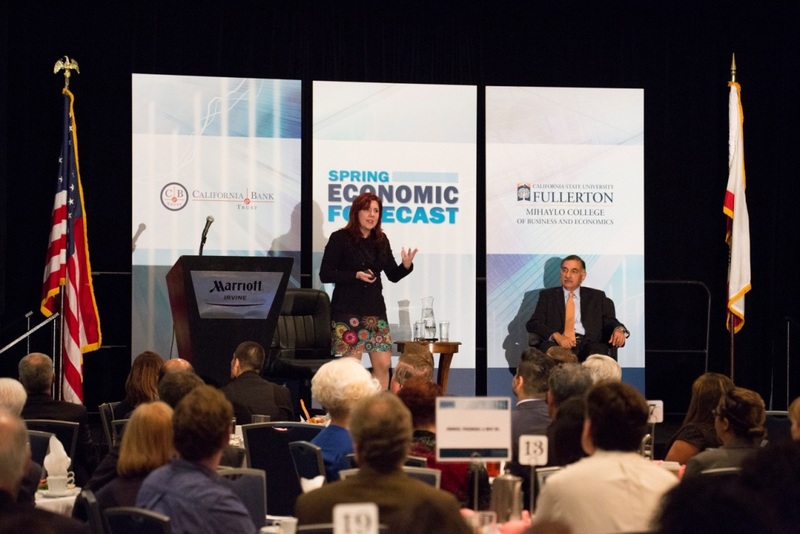 Cal State Fullerton Interim Provost and former Mihaylo College Dean Anil Puri and Associate Professor of Economics Mira Farka presented the spring update of the Woods Center for Economic Analysis and Forecasting Economic Outlook and Forecast at the Hotel Irvine on April 27. Continued steady growth is anticipated as the economy nears full employment. 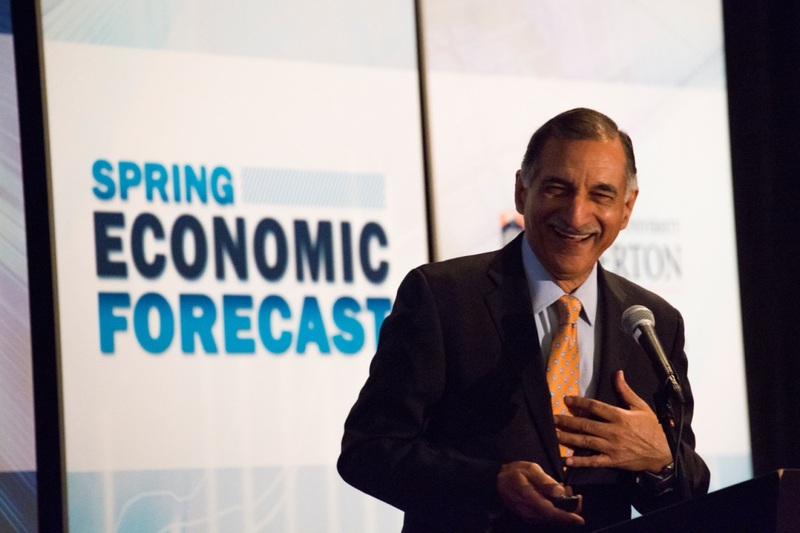 Despite continued concern that the expansion following the Great Recession would end and the economy would slip back into recession, the local, state, national and global economies continue to grow at a healthy pace, according to Mihaylo’s Woods Center for Economic Analysis and Forecasting midyear report, presented by CSUF Interim Provost Anil Puri, Woods Center director, and Associate Professor of Economics Mira Farka, Woods Center co-director, on April 27. While concerns over political gridlock, the Eurozone debt crisis, the slowing Chinese economy and geopolitical tensions have generated considerable angst in recent years, they have not been enough to derail the recovery, and the now mature expansion seems likely to continue into the foreseeable future. “Household wealth has never been so high and balance sheets never as pristine as they are now,” according to Puri and Farka, noting that household net worth is now $25 trillion higher than at the eve of the recession a decade ago. While delinquencies on student loans and auto loans have risen recently, the overall household debt situation is much more manageable than during the 2000s housing boom, with much lower systemic risk to the financial system. Markets have soared following Donald Trump’s victory last November, primarily over hopes of a regulatory and fiscal environment seen as more conducive to the business community. For several years, the current recovery was a jobless recovery, with job growth only picking up in the last few years. Now, with nationwide unemployment at 4.4%, the historic level of full employment has been reached and even exceeded. The broader U6 measure of joblessness, incorporating discouraged workers, is now at 8.9%, which is higher than in many previous expansions, but nearing the historical average of 8.7%. Despite these improvements, the labor force participation rate, particularly for prime-aged men, continues to remain low, which is of long-term concern. The housing market, while still somewhat restrained, is likely to get a boost as the oldest cohort of millennials reach age 35, which is typically a prime age for homeownership. For the first time in the current decade, economic growth in the Eurozone exceeded that of the U.S. in 2016, with 1.7% growth. Political risks are now a considerable concern on the European continent, where populist parties are making inroads in parliaments. Despite a slowdown in job growth in 2016 in keeping with a mature recovery, the California and Orange County economies continued to grow and add jobs. Puri and Farka noted that the state added 425,000 jobs in 2016 with Orange County employment growth in line with statewide figures. Job growth was strongest in the Inland Empire with a 3.5% growth rate in 2016. The construction sector led job growth in Orange County in 2016 with a 5.7% increase over 2015. The only major sector to experience a decline was manufacturing, which saw a 0.4% loss. More than a decade after the local housing market began to collapse and triggered the financial crisis, median home prices in Orange County have reached all-time records again, topping $720,000 in March 2017, according to data from CoreLogic. Puri and Farka note that local business leaders anticipate that the strong economy will continue. The Wood Center’s quarterly survey of business leaders’ expectations, known as the OCBX index, reached its highest level ever in the first quarter of 2017.
Business leaders surveyed viewed the nation’s political landscape as the most pressing concern at the moment, though they were divided on the best course of action. “Over 75% of the leaders indicated the political and economic reforms were their most pressing concern, with 55.6% believing that insufficient reform was the biggest threat and 20.4% believing that rapid reform was the biggest threat,” according to Puri and Farka. Federal Reserve interest rate increases, which are a long-term headwind for local housing markets, were cited as a concern by 13% of those surveyed. For more on the Woods Center for Economic Analysis and Forecasting or to read the full report, visit the center online. In addition to the midyear report, the center provides an annual report in October or November, as well as interim updates throughout the year. Previous: Previous post: Business Students: Have You Considered a Career in Business Journalism?